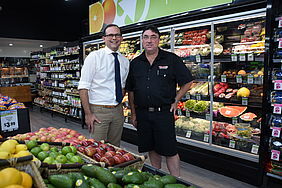 Member for Toowoomba South David Janetzki MP and Spar Southtown owner John Wilson. One of Toowoomba’s oldest shopping centres has undergone a major redevelopment and the family-owned supermarket at its heart has been given a modern revamp. 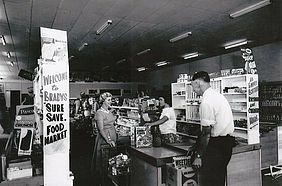 Southtown Shopping Centre was the first shopping centre to be built in Toowoomba outside of the CBD 63 years ago and was the original home of Super Rooster. Spar Southtown owner John Wilson said his supermarket renovations would make the centre more competitive with the big chain stores in the city. “We are a modern, full-sized supermarket now but still offer old fashioned service to our customers,” Mr Wilson said. “You won’t find any self-serve checkouts here - we still employ local staff, pack your groceries and will carry them to your car for you if needed,” he said. 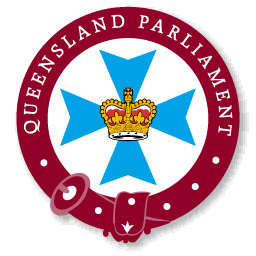 Member for Toowoomba South David Janetzki MP said it was pleasing to see such strong investment by families into their businesses. “Independent family-owned grocery stores, corner stores and hardware stores are the heartbeat of Toowoomba,” Mr Janetzki said. “We need to support family-owned businesses so we have competition and local employment opportunities in the future,” he said. Mr Wilson thanked his customers for their support over the past 18 years. “This is our way of giving back to the people who have supported us all these years. We have increased our hours from 7am to 7pm and we are open every day of the year including Christmas,” Mr Wilson said. JMK Retail General Manager Vicki Leavy said Southtown East Shopping centre was built in 1956 by Jack Kelly. “It was time for a little attention and a freshen up. The inspiration is intended to pay homage to the centres heritage by peeling back the layers and returning to its original shape and form,” Ms Leavy said. “The tenant mix is strong with a newly renovated Spar Supermarket, which will by a bottle shop and we are currently taking expressions of interest from prospective butchers once again offering the convenience of one-stop shopping,” she said. Spar Supermarket is holding a grand reopening event tomorrow with a free sausage sizzle from 9am to 12pm, goodie bag giveaways, and dance and karate performances from 11am to 2.30pm.